[D]estroy any unpleasant, embarrassing and downright forgettable memories from 2015 and pave the way for new memories in 2016. On Sunday afternoon, I pulled a muscle while getting onto a rather high horse on the Central Park Carousel. The searing pain that ensued felt like the cherry on top of 2015. And while I was able to walk away (in pain) ten minutes later, I was annoyed. Later that afternoon, while Isabelle and I were washing our hands in a restroom, I was shocked by my reflection in the mirror. I’ve aged this year, I thought. My skin isn’t radiant like it was back in March. just a few weeks after I started a gluten-free diet. Then I noticed my hair. It is grayer — so much grayer — than it was when 2015 began. I didn’t dare look down at my waistline. I didn’t even want to go there. Instead, I turned away from the mirror. On Monday afternoon, around the time people were shredding their forgettable memories from 2015, I made a phone call to my hair salon where Isabelle and I were scheduled for haircuts this morning. I asked if there was any way my stylist could find the time to put a gloss in my hair before or after my haircut. A few hours later I received a voicemail back from the owner. If I could come in a half-hour earlier, then my stylist could make it happen. I hustled Isabelle out of the house this morning. I explained that Mommy was going to do something extra at the salon today. After I explained what hair color was, Isabelle had a question. Why? Hmmmm… What could I say that wouldn’t disparage myself while telling her the truth? Once we arrived at the salon, I learned a gloss alone wouldn’t cover my grays. My stylist suggested a demi-permanent hair color, which doesn’t contain ammonia. It only lasts for 24 shampoos, but this kind of hair color blends away the gray while bringing out one’s natural color. Perfect. I started drinking a green smoothie every day earlier this fall. In addition, I drink green juice whenever possible. Luckily, I was able to buy a green juice from my favorite purveyor in Central Market right after my haircut and color. My hair was cut, then colored. Isabelle’s hair was cut while my hair processed. Isabelle sat calmly under the hair dryer while the color was rinsed out of my hair. As soon as my hair was dry, I leaned towards the mirror. I couldn’t see a single gray hair! Not a single one! It felt as though the past eight months of my life had been erased from my head. Even though my skin wasn’t a glow and my body isn’t as svelte as it once was a year ago, I felt so much better when I looked in the mirror. And right now, that is enough. My stylist walked over to me while I checked out. She reminded me to book extra time for coloring my hair in March. I thanked her for the reminder but assured her this would be a one-time thing. (NOTE: After a horrendous experience with a Sun-In type of product in 1992, I endured a double-process and highlights once my roots became unsightly. I haven’t touched my hair with dye ever since I went back to my natural color in early 1993.) My grays are a part of me I typically don’t mind. Sometimes I even lovingly refer to them as my wisdom streaks. However for the next month, I’m forgetting about those grays and all of the heartache they represent. However for the next month, I don’t see those “wisdom streaks.” Covering up my gray is part of my plan to pave the way for a better year in 2016. I’ll reveal the other part of my plan, which I began working on earlier this month, over at Two Writing Teachers next Thursday when I share my One Little Word for 2016. Health, peace, and beautiful surprises. I could go for all three of those things in 2016 and beyond. And that is what I wish for you, too, in the year to come. 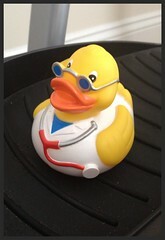 My daughter has a small rubber duckie collection. She placed “Dr. Duckie” on my elliptical rider’s foot pedal. Is she trying to tell me something? I was feeling a bit sluggish when 2012 came to a close. I gained a few pounds in December since we went to New York and celebrated our anniversary. Even though I had been going to bed at 10:00 p.m. nearly every night and was exercising, I wanted to be healthier and more vital in 2013. In an effort to keep my wellness top of mind, I picked “vitality” to be the one little word to guide me through 2013. About a week into January I got sick with a sinus infection that was so bad it affected my asthma and required two courses of antibiotics. 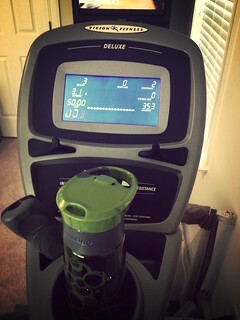 I barely exercised that month, which means that when I got back on the elliptical rider and the reformer, it felt as if I were a newbie working out for the very first time. If I had made a resolution to workout more, then perhaps I would’ve given up. However, one little word is like a marathon. I couldn’t give up since that was my word of the year. hit the reset button on February 1st, once I was completely better, and renewed my quest for vitality. I’ve completed 96 Headspace sessions since I purchased my one-year subscription. I began meditating in late March as a way of trying to achieve a greater sense of overall vitality. 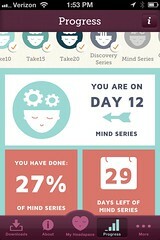 I started out by listening to a 10 minute podcast from a program called Headspace, on my iPhone. Initially, it was challenging to carve out 10 minutes in my day for this purpose so I was meditating before bedtime, which meant I’d often fall asleep during the meditation. I rescheduled my meditation for earlier in the day and began to have more energy and found a greater sense of calm. Every day I listen to a 20 minute podcast, which helps me reset my body and my mind. As a mother of a toddler, I have found I have more energy for keeping up with my daughter since I started meditating. Furthermore, I have more patience for dealing with the inevitable mood swings and the constant testing that go along with having a toddler too. My meditation time is something I closely guard and value as part of my daily life. My husband reminds me (often) that I need to make myself a priority. He plays with Isabelle or takes her out on the weekends so I can make time for exercising and meditating while Isabelle is awake. (That enables me to use her nap times to do work.) In fact, if he comes home from work and finds out I was unable to carve out the time to do either one of those during the day, he takes over so I can take care of myself. Having his support certainly makes it easier to achieve greater well-being. If I’m lucky (and I mean really lucky), Isabelle will nap for three hours in the afternoon. That means I have three hours to meditate (25 minutes), workout (60 minutes), and get work done (95 minutes). That doesn’t leave a lot of time for work, which means I often spend the evenings, after she goes to bed, writing and working on presentations. Since I’m still in bed by 10:00 p.m. (and up by 6:00 a.m.), I often have to have someone watch Isabelle so I can get work done before presentations and consulting engagements. While hiring an occasional babysitter isn’t ideal, I have to balance my day times in order to stay true to myself on my quest towards vitality. However, I know I’m a better mother, wife, daughter, and friend when I am well-rested, take care of my brain, and treat my body well. Therefore, this is the path I’m sticking with for the remainder of this calendar year. As for the rest of 2013, I’m going to try to drink more water and reduce the amount of chocolate I eat. (NOTE: Reduce, not eliminate!) Also, I’ve been in the process of cutting back on the amount of caffeine I consume. I’m still going to work on that for the remainder of the year. What one little word are you living by this year? How is your word helping you stay on track with your goals or do you need to reset and give yourself another chance to live by your word this year?